Kevin's gone this week. Can the guys do a show without their fearless leader? Spoiler Alert: The answer is "mostly." 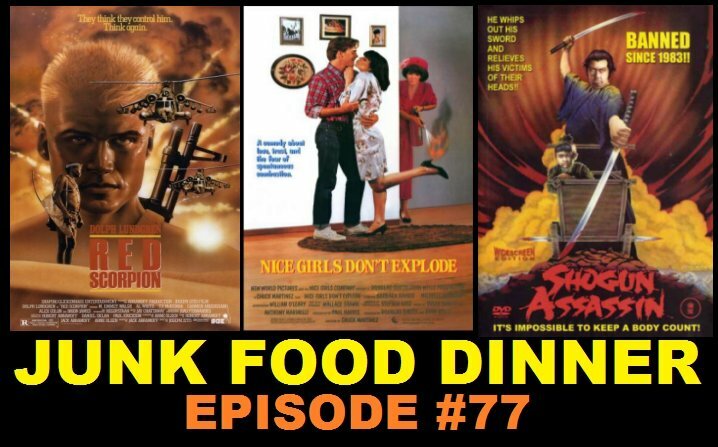 Professional podcaster Mike Dikk from Kissing Contest fills in and we talk about three pretty different, mostly interesting movies. First up, we discuss Dolph Lundgren's 1989 action flick, "Red Scorpion." The movie is directed by JFD-favorite Joseph Zito. Oh, and Parker picked it based on a .gif he saw of a guy blowing up. Next up is "Nice Girls Don't Explode" from 1987. This fiery tale of unbridled passion and burning will leave you feeling the fuego. Wallace Shawn co-stars in a performance that sets the screen ablaze. Finally, we discuss a Samurai dad in 1980's "Shogun Assassin." The film was cut together from pieces of two of the "Lone Wolf and Cub" films and was banned in England for a while due to some awesome fighting. Also, if you like the show, please take a minute and subscribe and/or comment on us on iTunes, Blubrry or Stitcher. We gain precious nutrients from your love and support. Another really funny, on-form show. I like the rotating guest roster and line-up change. Fun stuff. Thanks for entertaining me at work. For the masculine flipside of the NICE GIRLS DON’T EXPLODE coin, check out MY DEMON LOVER (1987); in which Scott Valentine gets cursed with a case of “Romanian blue balls” and literally gets horn-y every time he’s aroused. And, on the case for the evidence of the existence of chubby badasses, I submit the “Skinny Tiger, Fatty Dragon” himself: Sammo Hung (who notably most recently choreographed IP MAN 1 and 2, and starred in 2, as well as choreographing Tsui Hark’s newest movie; DETECTIVE DEE AND THE MYSTERY OF THE PHANTOM FLAME). The guy is a legend, and one of the all-time martial arts greats in action movie history. His gracefulness, speed and acrobatic ability defy his filled-out form. Just watch almost any Hong Kong movie he starred-in, choreographed or directed from the late 70’s to the mid-90’s as proof. You jested Hot Dog Assassin, but BURGER COP (1995) is a reality. Although to be fair, there aren’t any burgers in it and it is far, far, far, far from his best. Check out instead proof in; THE PRODIGAL SON, WHEELS ON MEALS (now on instant watch! ), CLOSE ENCOUNTERS OF THE SPOOKY KIND, SHANGHAI EXPRESS and on and on and on. Also, me and my girlfriend actually used to have a game where we tried to predict the next featured sport and clever dog pun title that would be used for future installments of the seemingly never-ending juggernaut series of straight-to-video AIR BUD sequels. On bored bygone days at the video store we even kept a notebook and drew up mock cover art and taglines. This is want we figured; after using football for AIR BUD: GOLDEN RECIEVER, soccer for AIR BUD: WORLD PUP, and volleyball for AIR BUD SPIKES BACK, we we’re sure everybody’s favorite canine athletic virtuoso would be in white gloves and Polos for AIR BUD: MUTT-MUTT GOLF, or perhaps he would square-off against an evil species sworn enemy feline foe, one that liked to hit birdies as much as it liked to catch and eat them, in AIR BUD: BAD MITTENS…….or maybe Bud would prove to have knack for the cards and be the “come from behind underdog” that follows his tail on up the ranks of the World Championship Series of Poker in AIR BUD: ACE SNIFFER (or maybe HOLE IN THE ACE, we couldn’t decide)…….or perhaps the producers wanted to get away from dog puns altogether and just stick with regular puns for the “slapstick” hockey comedy AIR BUD: PUCK YOU!.......or maybe they would decide to get serious and enlighten kids about the dangers of drug use as a heroin-addicted tennis-playing Bud struggles to dig up his buried needles during a bid for the Wimbledon cup in AIR BUD: SMACK ADDICT. But with the likes of surfing, snooker, pinball, ping pong and more still yet untouched, they opted to drop the sports theme and spotlight an eternally youthful litter of Bud’s offspring instead, having only to slap the no-brainer “Buddies” after a given theme world. I thought all was lost until I actually saw a trailer for SPACE BUDDIES the other day and had my mind boggled as to what these people must have been thinking as they photographed it on some surreal soundstage. It reminded me to get my act straight and start checking out these shameless, noxious, surreal and baffling AIR BUD sequels. The new Halloween themed SPOOKY BUDDIES actually has Harlan Williams in it, so I was sold on that one straight off as I do love ROCKETMAN. What do you think, start a contest for the best AIR BUD sequel idea, with prizes to be handed out on air?